This is historical lies . The Labour left, including leading figures such as Eric Heffer MP and Jeremy Corbyn MP were opponents of the East European regimes and actively campaigned against the suppression of democratic rights in the Soviet Union and Eastern Europe. In contrast the hypocritical Tories were prepared to collude with the Stalinist regimes when it suited them, such as with the Polish junta of General Jaruzelski to obtain cheap coal to break the British miners strike. C coal mined in conditions of absolute repression whilst leaders of the independent trade union Solidarnosc rotted in prisons. Above Jeremy Corbyn MP speaking alongside Marko Bojcun leading Ukrainian socialist and supporter of the popular movement Rukh. When the East European Solidarity Campaign was set up in 1978 leading supporters were Eric Heffer and Philip Whitehead both Labour MP’s. 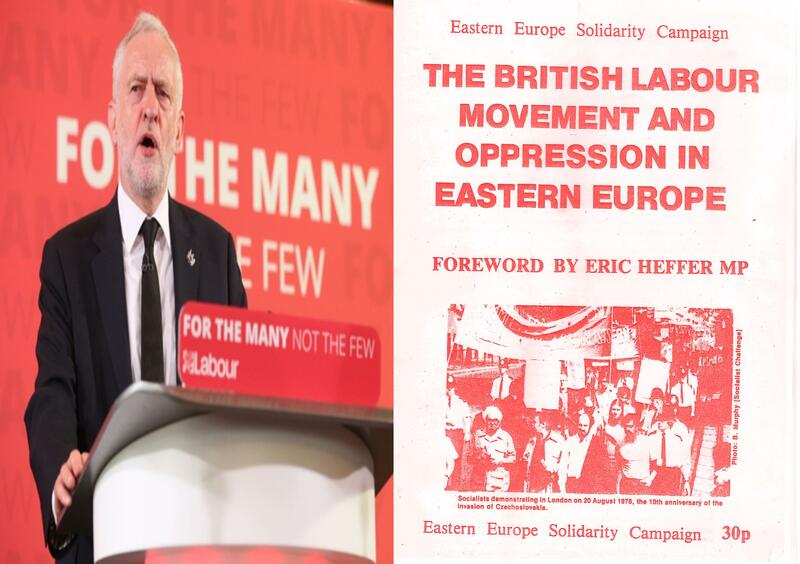 Published below is the Foreword to the pamphlet The British Labour Movement and Oppression in Eastern Europe by Eric Heffer MP a leader of the Labour Left. Above: Campaign to clear the names of victims of Stalinist show trials. Supporters include Jeremy Corbyn MP. It is impossible to create a socialist society without freedom. Socialism and freedom are indivisible. Socialism means the flowering of the human spirit, not its destruction. Yet in part of the world, and in particular in the Soviet Union and the East European Communist-controlled countries, oppressive measures and administrative actions are taken against critics, in the name of socialism. Such oppressive measures have to be opposed, especially by socialists. The truth is that such actions are a blot on the name of socialism, and hold back the struggle for socialism in Western Europe by decades. There are, however, some British workers — a tiny minority — who continue to live in the past. They defend every action of the Soviet leaders, believing that in doing so they are protecting the Soviet Union from capitalist forces internally and from hostile capitalist elements outside. The fact that such workers exist, and that some of them write to write to the Soviet Embassy, is taken by the Soviet leaders as ‘proof that British workers are supporting them in their action against dissidents. The Soviet authorities therefore get a false impression. The overwhelming mass of the British working class are bitterly opposed to oppression in the Soviet Union, in other East European countries and elsewhere. And their opposition has to be mobilised to help those in the East European countries who wish to build a genuinely democratic socialist society. East European Solidarity Campaign picket of the East German Embassy with Philip Whitehead MP – calling for release of Rudolf Bahro. This pamphlet by the Eastern Europe Solidarity Campaign is part of that mobilisation of the British labour and trade union movement, in support of those socialists, communists and trade unionists in the Communist-controlled countries who are seeking to change these societies into genuinely socialist societies. These comrades need our support. In Czechoslovakia there are those who signed Charter 77. They are being persecuted, imprisoned or made unemployed because of their action. In the Soviet Union, there are the workers, socialists and intellectuals who are imprisoned, sacked or placed in mental institutions because they dare to criticise, write books or poems, or seek to live abroad. Many of them are no longer socialists, equating the Soviet system with socialism, and recoiling from it. On the other hand there are others who retain their socialism, are strengthened in their resolve to obtain it precisely by their understanding of Marxism, and their practical experiences in the Eastern European states. Ukrainian miner Vladimir Klebanov (left) with other members of the Soviet Free Trade Union Association announce the creation of the independent union. Socialists campaigned for his release from prison. In Poland there have been the workers’ struggles, with the creation of the Workers’ Defence Committee and the trade union committees, and in the Soviet Union we have seen the attempt by groups of workers to form trade unions independent of the state, similar to those that exist in Britain, France, Italy, the USA etc. In East Germany we have seen the imprisonment of Rudolf Bahro, an avowed Marxist, member of the CP, imprisoned for 8 years because he dared to write a book, The Alternative, outlining alternative Marxist concepts to those of the official leaders. All these individuals and groups deserve our support, even if we do not always fully or even partly agree with their political ideas. To give such support does not mean that one is siding with those hostile reactionary forces who wish to create confrontation and possible war with the countries in which they live. Unfortunately the Soviet and other East European Communist leaders are helping the reactionary forces by their actions against the dissidents, the workers, the socialists and communists who are critical of the regimes. The Soviet leaders make the struggle for socialism in the Western world much more difficult. Perhaps they don’t care, because if they did, they would desist from their oppressive actions. They are, of course, protecting their own privileged positions. If free and open debate took place in these societies, the people would demand change, as they did during the Polish Spring, the Hungarian Revolution and the Czechoslovak Spring. The attempt by Dubcek and his colleagues to create “Socialism with a Human Face” had to be suppressed by the Soviet leaders because, if it had been successful, the peoples of the Soviet Union and the other East European countries would also have wished to establish similar types of societies, and that would have meant the end of the privileged position of the Soviet and other bureaucrats. What is interesting is that the Socialist and Communist movements throughout Western Europe in particular are undergoing serious changes. The Communist Parties such as the Italian, Spanish, and to a lesser extent, the French have clearly distanced themselves from Soviet policy, especially towards the dissidents. This gives great hope for the future, and it must affect the situation in the East European states. The time has therefore come when all of those who believe in socialist democracy, irrespective of other differences, should stand together in solidarity with those in the Eastern European states. Our struggle for socialism must be genuinely international. It means the defence of those who are oppressed in Chile, Argentina, Brazil, South Africa, Indonesia, Iran, and other East European countries. Socialists cannot have double standards. It is essential to oppose oppressive actions everywhere, especially in our own country. This pamphlet clearly outlines the basic views of the EESC. Naturally everyone in support of the Campaign does not agree with every formulation in the pamphlet, but they do agree with its basic message. I ask you, if you do agree with it, to join the Campaign; to get your Labour Party and Trade Union and Trades Council to also give their support; to get resolutions supporting the ideas of the campaign carried and forwarded to the National bodies, and to get them to support the Campaign also. In doing so you will be making a serious contribution to socialism, not only in Britain but also in Eastern Europe. During the Miners Great Strike of 1984-85 the Tories shipped coal from the Stalinist regime in Poland to break the strike. An appeal condemning the conduct of the regime and the suppression of the independent trade union movement was issued by leading figures of the labour movement including left Labour MP’s, Denis Canavan MP, Jeremy Corbyn MP, Eric Heffer MP and others. The Stalinist Morning Star ran by the Communist Party refused to publish it. It is copied below.